Opuntia ficus-indica is more commonly known as a Barbary fig. This desert plant has been used for centuries as food, fending, and even dye. 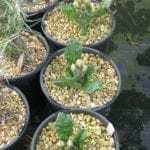 Growing Barbary fig plants, as long as you live in the right climate, is both rewarding and useful. What is a Barbary Fig? Barbary fig, a variety of prickly pear cactus, is thought to be native to Mexico where it has long been used for a variety of purposes. The fruits and pads can be eaten by humans and livestock, and the size, sprawling growth, and thorns make this cactus a good natural fence and barrier. The insects that are used to make red dye feed on prickly pear, which has made it an economically useful plant. Today, the plant has spread far from Mexico. It is common in the southwest U.S. and is considered invasive in Africa. 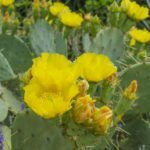 While Opuntia/Barbary fig info is practical for so many purposes, this plant is also great as simply an attractive addition to the garden. The plant grows green “pads,” which are covered in spines. At the tips of the pads, yellow to orange flowers bloom, followed by red fruits. 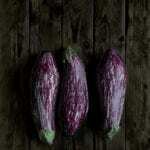 The fruits are also known as tunas. Both these and the pads can be prepared and eaten. As a cactus, this plant requires a desert climate to thrive: dry, hot conditions. It is hardy through zone 8, but is best in hotter regions. For the right location, Barbary fig care is easy. Give it a spot that gets full sun and little water. If you live in the desert, you can essentially put your cactus in a suitable area of the garden and leave it alone. It will grow and thrive. If you want to grow it indoors, it will do well in a container that is big enough. With the right sunny spot and dry soil, your Barbary fig may grow as tall as ten feet (3 meters), so give it plenty of space, or plan spacing accordingly if you want to use it as a fence.